This colorful Radar satellite kite is absolutly high quality huge easy flyer and eye-catching ,one of the best toys for ourdoor games and activities,fly it with your family and enjoy the wonderful time this weekend! This set contains small parts and does not fit for the kids under 3. ORDER A HIGH QUALITY KITE RIGHT NOW! The kite is strong，resin rods are more light and tough，rip-stop nylon with double crossing sewing，leading string is woven by 8 gentle lines，this item will last years and years. SIMPLE AND EASY TO USE. Comes partially pre-assembled and includes easy-to-follow assembly instructions.Kite line, spool,tails,everything is ready to soar in the sky! A RAINBOW 3D RADAR SATELLITE. 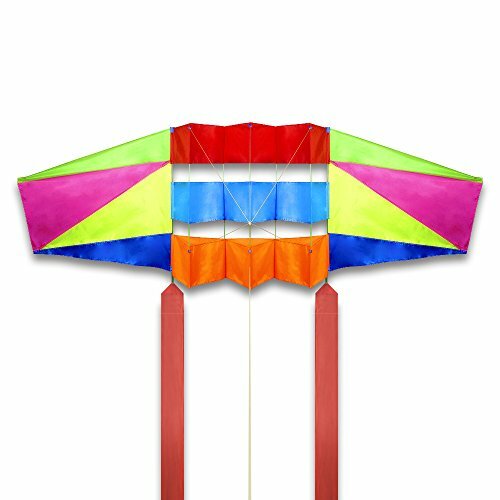 This colorful kite is 2.5m x 0.8m，with 15m twins long tails，let's join in the star wars in the universal space this weekend. ESPECIALLY SUITABLE FOR THE BEACH，field,park,and so on.If you are plan to take a vacation on the beach， take this kite would be a great idea.Come with kite bag and easy to take it in your travels. If you have any questions about this product by Mint's Colorful Life, contact us by completing and submitting the form below. If you are looking for a specif part number, please include it with your message.